Blood Queen | ExpressCasino.com - Top Online & Mobile Slots Jackpots! Blood Queen | ExpressCasino.com - Top Online & Mobile Slots Jackpots! If you are would like to play best slots bonus game with a gothic theme, then you should try out Blood Queen on Express Casino online gaming site. This is one of the Best Slots Bonus game around and brought to you by Iron Dog. The dark and scary feel to this video slot is something lovers of horror flicks would like. There is an expanding wild, and free spins feature available to boost wins and payouts. Read on to get more information on the features of this video slot. Blood Queen comes in five reels and 30 active paylines. With a minimum wager of £0.30 per spin, you can enter into the scary world of the blood-thirsty Queen by getting the reels spinning. 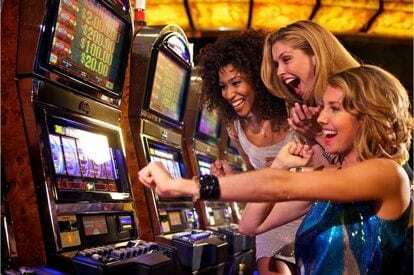 What is most impressive about this video slot is that it can be played on Express Casino online site with good video and audio output. The graphics are set against a dark theme with background music that sets the tone for the game. In the backdrop, you can see a spooky cemetery with tombstones glimmering in the moonlight. On the reels, you have symbols such as tusks, ruby and even a demon as well as the standard playing cards of A, Q, J, K, 9 and 10. These cards are set in ornate pendants and add to the mystique of the slots. This is one of the Best Slots Bonus game out there because it has a Gargoyle Wild that expands on the reels. The expanding wild will help players land wild assisted winning combinations on a more consistent basis. The wilds will also substitute both the high and low-value symbols on the reels to help players with landing combo wins. However, the wild cannot replace the game's two Scatter symbols. These are the Blood Queen and the vampire hunter Van Hell symbols. With the scatter symbols you can trigger the game's free spins round. In this Best Slots Bonus game, you have a Free Spins feature available. This feature is activated when you land a minimum of three scatter icons. By landing three scatter icons, you will be awarded 20 free spins. When you land four scatter symbols, you will get 30 free spins, and you will receive 50 free spins for landing five scatter icons. As a bonus to the free spins awarded, players can have special wilds added to the reels. If you land a minimum of three Van Hell scatters icons, you will have a Holy Water wild added. For the Blood Queen scatters, you get a Blood Potion wild included on the reels. These wilds expand on the reels and help players to gain winning combos more often than not. This is truly one of the Best Slots Bonus game available as players can be rewarded with a multiplier of as much as 4,000x their stake. This is a slot particularly suitable for any player that has a thing for night and night creatures.